Disarray and disappointment were precipitated after a sequence of agreed events and statements designed to provide a positive context within which to hold the forthcoming northern elections were inexplicably ditched by Ulster Unionist leader David Trimble on Tuesday. Trimble announced he was pulling out of his part of the sequencing agreement shortly after it had been officially confirmed that republicans had fully adhered to their commitments and as the British Prime Minister and Irish Taoiseach were poised to confirm the restoration of the power sharing institutions. Unable to point the finger directly at republicans, a petulant David Trimble ditched his prepared statement and rounded upon General de Chastelain and the government appointed Independent International Commission on Decommissioning. Unceremoniously branding de Chastelain as "the joker in the pack" and his report as a failure, Trimble announced that, "as a result of what the IICD has done we probably have less confidence in the process than we had an hour ago. "Because of that I regret that I am not in a position to make those statements. We are in effect now putting the sequence on hold," Trimble told an astonished press conference. The UUP leader said he would be calling a meeting of the party's ruling council for Wednesday to "give republicans, who foolishly imposed obligations of confidentiality on the IICD, the opportunity to repair the damage". The UUP leader conceded, "there may possibly have been substantial acts of decommissioning" but the report had been inadequate, he claimed. "We had made it very clear to the governments and General de Chastelain that what we needed was a transparent report of major decommissioning of a nature which would have a significant impact on public opinion," said Trimble. In other words, the substance was there, the spin was not. During an afternoon press conference, John de Chastelain announced that the commission had "witnessed a third event in which IRA weapons were put beyond use in accordance with the governments‚ scheme and regulations". In his initial statement and during a subsequent question and answer session, the general, while adhering to the confidentiality clause guaranteed by the legislation, went further than usual in his report by describing the range and extent of weaponry that had been put beyond use. "The arms comprised light, medium and heavy ordinance and associated munitions. They included automatic weapons, ammunition, explosives and explosive material. The quantity of arms involved was larger than the quantity put beyond use in the previous event," said de Chastelain. But despite this, the general's best offices were rejected by the UUP. In Hillsborough Castle, a perplexed Tony Blair described the unionist leader's out burst as a 'glitch' and announced that he and Bertie Ahern would be staying in the hopes that a few hours' effort would overcome any difficulties. "We are very, very close to what I think would be a quite historic day," said Tony Blair. "We had a sequence that was going very well but there's a difficulty, an obstacle and we have to try to resolve it if we can." Bertie Ahern promised his government would do all it could. 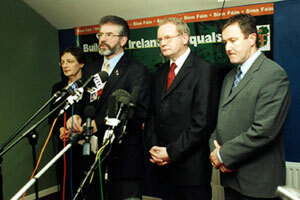 At a press conference, Sinn Féin confirmed that the party had sought immediate meetings with both governments and the UUP. But by early evening it was clear that no immediate progress was possible and the two prime ministers left. A day that had been heralded as the most important since the signing of the Good Friday Agreement ended without any clear way forward. The process had been kicked off with an early morning announcement by the British government that elections to the Stormont Assembly will take place on Wednesday 26 November. The fact that Sinn Féin had won the argument for elections to be held had been even acknowledged by David Trimble. Confirmation of the election date was swiftly followed by a groundbreaking statement by Sinn Féin's Gerry Adams, later described by an IRA statement as accurately reflecting their position. "All of the participants and the two governments have significant contributions to make if the institutions are to be restored and the Good Friday Agreement made to work efficiently and effectively," Adams had said, unaware of the later significance of his observation. "It isn't just down to republicans. It never was. Making this process work is a collective responsibility," Adams had said. The Dunmurray hotel had been packed with reporters and camera crews to record a hugely significant speech by the republican leader. "Republicans need to know that the two governments will honour their commitments. Republicans need to feel confidence in a unionist leadership working the institutions and the Agreement and joining with us as partners in the task of building a better future for our people," said Adams. Highlighting the need for a two-way process, Adams acknowledged that unionists also needed to have confidence in republicans. "Implementation by the two governments and the parties of their commitments under the [Good Friday] Agreement provides the context in which Irish republicans and unionists will as equals pursue their objectives peacefully, thus providing full and final closure of the conflict," said Adams. "Actions and the lack of actions on the ground speak louder than words and I believe that everyone-including the two governments and the unionists-can now move forward with confidence. "As President of Sinn Féin, I have set out a peaceful direction which I trust everyone will follow. Sinn Féin's position is one of total and absolute commitment to exclusively democratic and peaceful means of resolving differences. We are opposed to any use or threat of force for any political purpose," said Adams. Change is a matter of choice not chance, said Adams, and Sinn Féin is totally committed to establishing an entirely new, democratic and harmonious future with our unionist neighbours. In the statement endorsing Adams' speech, the IRA went on to announce that it had authorised a further act of putting arms beyond use. A few hours later, the IRA released a second statement confirming that this had taken place. De Chastelain reiterated the confirmation and outlined the nature of the action. It had been a hectic day but the sequencing had run like clockwork until it was time for David Trimble to contribute. Sinn Féin learnt of the UUP's decision to scupper the sequencing from the media but despite obvious provocation, the party's leadership refused to "play the blame game" and described themselves as "problem solvers". After a brief press conference, the Sinn Féin team left for Hillsborough to speak to the two prime ministers and to David Trimble. Later, talks between Sinn Féin and the UUP moved to Stormont but there was no immediate breakthrough. "We had an agreement," Sinn Féin President Gerry Adams told representatives of the world media pressed cheek by jowl in the small upstairs conference room in Belfast's Sevastopol Street on Wednesday morning, "and all of the people who were actually party to the sequencing of the developments yesterday knew what was happening. "There are obviously very profound difficulties in the process at this point and we still don't know how they can be resolved in the short term; in the long term all of these matters will have to be resolved," said Adams. Adams dismissed unionist claims that they had been in some way let down. All parties to the sequencing knew what would be happening, said Adams. If that weren't the case then "why would the two governments come if they had not been totally on board? Why would I have said what I said? Why would the IRA have done what it did? "In the midst of speculation as to why this broke down, and the focus of the de Chastelain report and the focus on the needs of the Ulster Unionist Party, there's a danger that what was achieved yesterday will be diminished. And I think this is something that at all costs needs to be avoided," said Adams. "Yesterday's agreement emerged from long discussions between ourselves and the UUP and that development in itself should not be undervalued. That dialogue is in many ways the key to progress," said Adams. The Sinn Féin President told the media that, despite discussions with the UUP, the party still had no satisfactory explanation as to why the agreed sequence did not go forward. Adams pointed out that the IICD had been established under an agreement that had been endorsed in legislation in both the Irish and British parliaments. "If the head of the IICD can say that the commission witnessed an event in which IRA weapons were put beyond use in accordance with the governments' scheme and regulations," said Adams, "it is incumbent upon both governments to confirm, promote, validate and uphold that. 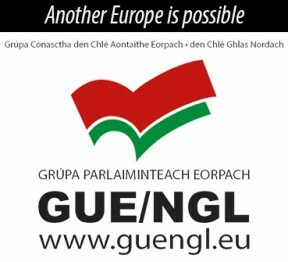 "We can all chase our tails from now until kingdom come, asking hypothetical questions like what if the IRA had just said this or that, or if that clause had been lifted and we can all look at the problems within the UUP, but when a commission performs its duty in accordance with the governments' scheme and regulations, I am looking for that actively to be supported and defended by both governments. "If this is to be sorted out in the short term, it must be sorted within the next few days, and if not then it will have to be put off until after the elections. We'll do our best but there is no clear way that that can be accomplished," said Adams. 6pm Tony Blair and Bertie Ahern announce a 'glitch' but say it can be resolved within hours.